Since receiving his Chemistry credential from CSUCI in 2006, Loren Dacanay gives an annual presentation to Associate Professor of Education and Political Science Tiina Itkonen’s class on working with special education students. 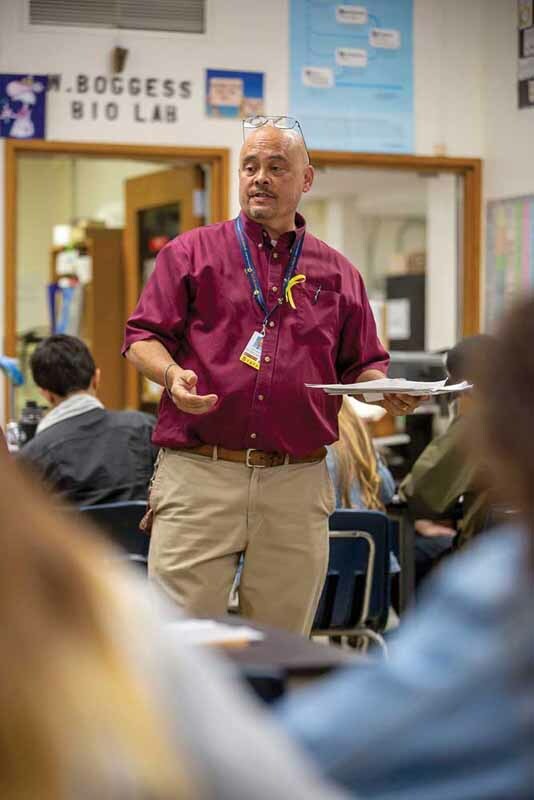 In 12 years of teaching, he has worked with many students who have had disabilities to make accommodations for experiments in his chemistry lab. During his fall 2017 visit, a student in Itkonen’s class raised her hand after his talk. In front of the class, she explained that she was a former high school student of Dacanay’s. The confidence he had instilled in her had made her feel empowered and led her down the same pathway to teaching. “I started to cry,” Dacanay said. “I remembered her and how she struggled in the class. At the time I thought she needed a cheerleader, and I stuck a note in her textbook that said, ‘You can do it, I believe in you.’ The student shared that if it hadn’t been for that note she wouldn’t have been in Itkonen’s classroom. “It’s one of those things where you say, ‘Wow, I really did what I set out to do. I changed the world a little bit,’” said Dacanay. Dacanay came to teaching later in life. After receiving a bachelor’s degree in enology from the University of California, Davis, he worked in the food and consumer chemical industries for more than a decade. When he became a stay-at-home father, he volunteered at his children’s Thousand Oaks elementary school. Others encouraged him to pursue teaching when they saw how comfortable he was in the classroom. He remembered enjoying his undergraduate coursework in chemistry and chose CSUCI to pursue his credential. Dacanay’s connection to CSUCI is deep — he worked on his Eagle Scout Project at the Camarillo campus when it was still a hospital, and his sister, Joanna Murphy, is a longtime CSUCI staff member. “CSUCI is really close to Thousand Oaks, so it was also easier to put in the extra time to get another degree while still watching my kids,” he said. He currently teaches chemistry as well as Advanced Placement seminars and research courses at Simi Valley High School. He enjoys speaking to Itkonen’s classes, as he believes that sharing his real-world experience can help future teachers make lessons for students of all abilities. To Itkonen, Dacanay is a prime example of a teacher that values inclusion. To Dacanay, the most important thing about teaching is developing mentoring relationships with his students — as well as helping the future teaching generations.